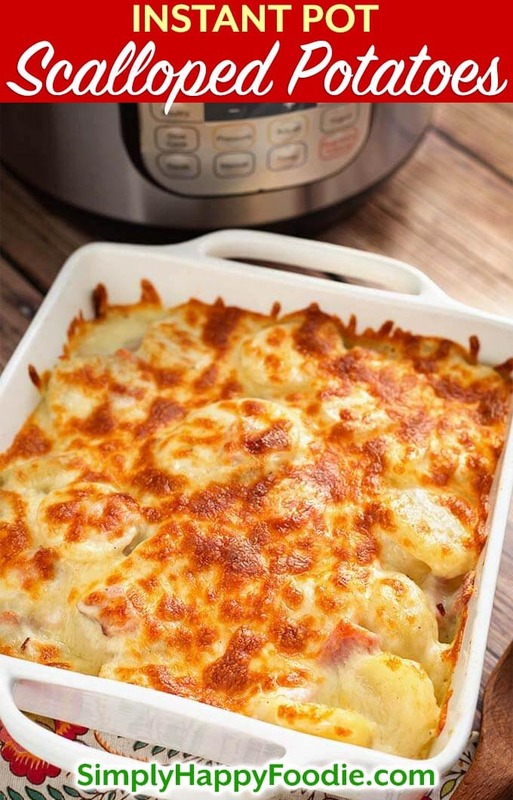 Instant Pot Scalloped Potatoes are cheesy, and have a delicious flavor, especially when you use a smoky ham and some nice cheese for extra creaminess. 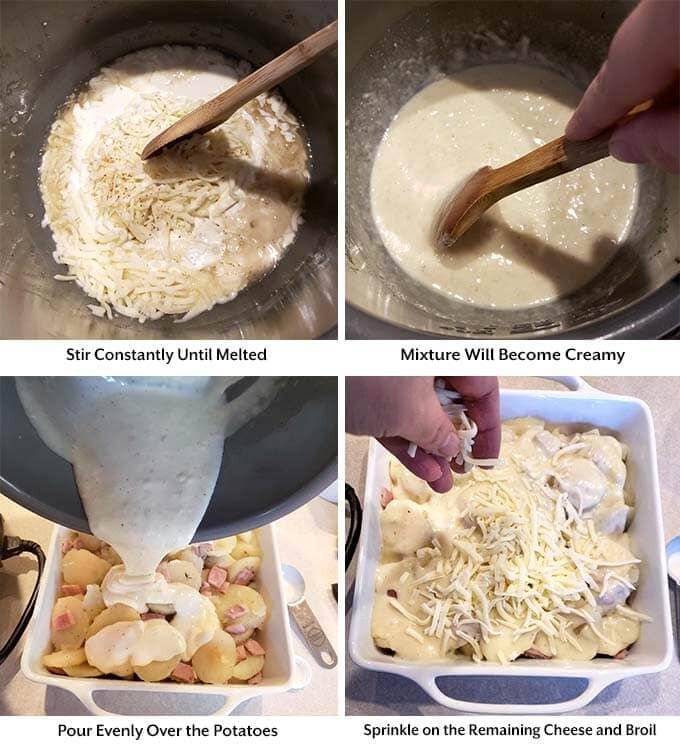 These pressure cooker cheesy scalloped potatoes cook much faster than in the oven, and are my family’s favorite Easter side dish, as well as Thanksgiving side dish! Every year for both Easter and Thanksgiving I make scalloped potatoes. For Easter, I omit the ham as we eat a big ham separately. As a Thanksgiving side dish, Instant Pot Scalloped Potatoes are perfect with the ham added! Your family and guests will gobble them up! 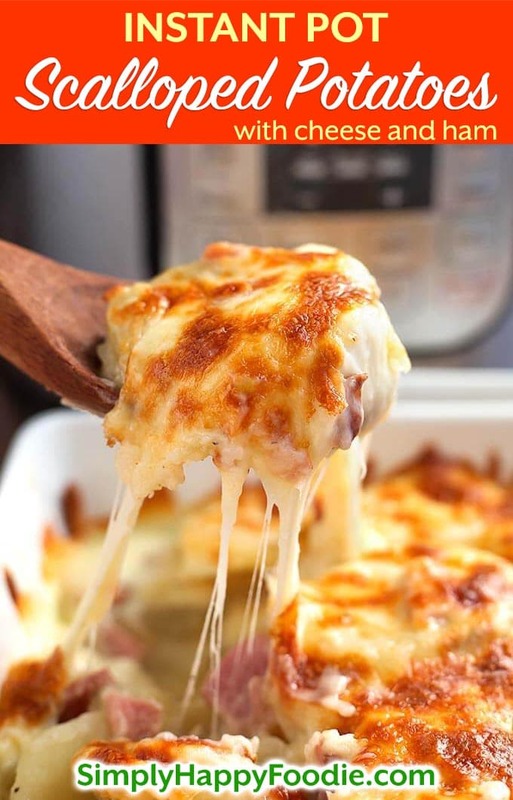 I know that these aren’t traditional scalloped potatoes because they have cheese in them. My family like these both ways, and I sometimes make the version without cheese. I keep everything else the same. Melt 4 Tbsps butter in the pan on Sauté Low heat. Once melted, stir in 4 Tbsp flour until smooth. Increase heat to medium and slowly whisk in milk until thickened by the roux. Add more milk to thin it, if needed. Then pour over the potatoes (See recipe card Notes for full instructions). Cooking vegetables in the electric pressure cooker, such as the Instant Pot®, is easy and very fast. The pressure cooks them much faster than in the oven. These scalloped potatoes only need a minute to cook! Then you will make a cheesy sauce (really simple) in the pot and pour it over the potatoes. So much yum! When you broil the scalloped potatoes, keep an eye on them so they don’t get burnt. It might look like they will take a long time when you check them. Then all of a sudden they are brown! My favorite part is that golden crust of cheese on top! I like to use Monterey Jack, but you may find that you prefer a different kind of cheese. Have fun with it! 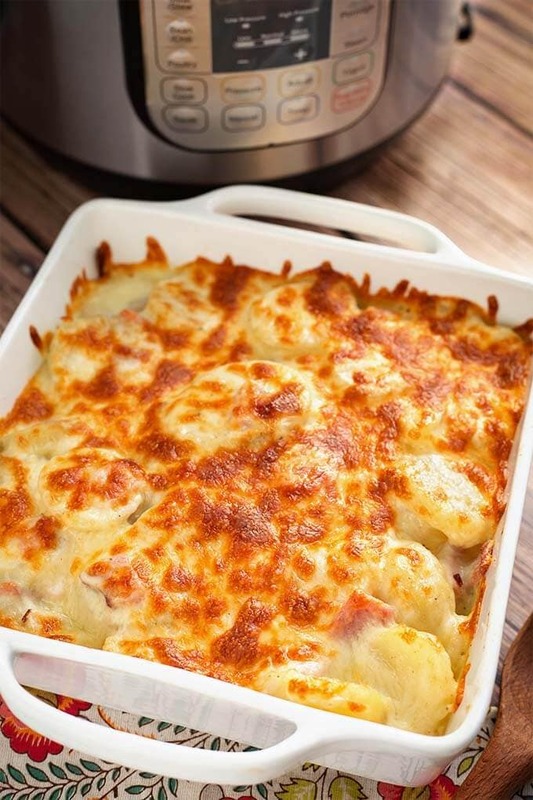 Instant Pot Scalloped Potatoes are cheesy, and have a delicious flavor, especially when you use a smoky ham and some nice cheese for extra creaminess. 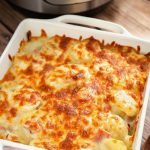 These pressure cooker scalloped potatoes are my family's favorite Easter side dish, as well as Thanksgiving side dish! Peel the potatoes and slice them 1/4" thick (no thinner as they will be too soft. No thicker or they may not cook completely). Add them to the pressure cooker pot. Stack a few slices of the ham on top of each other and cut them into strips, then into squares. Add to the pot. Sprinkle in the salt, pepper, onion powder, garlic powder, and thyme leaves, if using. Pour in the cup of broth. Put the lid on the pot and set the steam release knob to the Sealing position. Then press the Pressure Cook/Manual button or dial, then the +/- button or dial to select 1 minute (yes, one). The pot will take several minutes to come to pressure. When the cooking cycle has ended do a Quick Release of the pressure by turning the steam release knob to the Venting position. When the pin in the lid drops down, open the lid. Using a large slotted spoon, carefully remove the potatoes to the 8"x8" baking dish, leaving behind the broth/liquid in the pot. Adjust your oven rack to be about 6" to 8" from broiler element. Then turn on your oven's broiler to 400° to heat up. Turn on the Sauté setting (Low heat) of the pressure cooker. Add 1 1/2 cups of the cheese*, the heavy cream, and the nutmeg to the liquid left in the pot. Stir until melted and creamy, then turn off the pot. 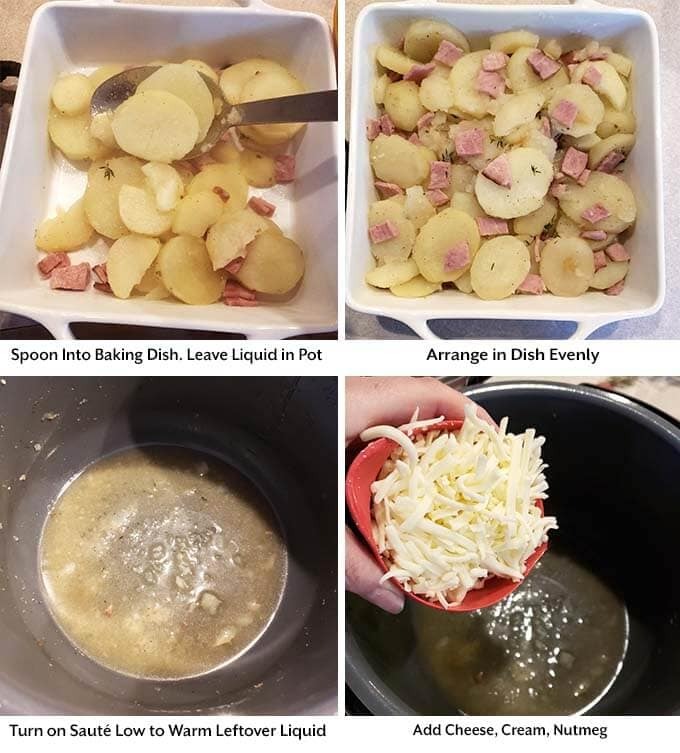 Spoon or Pour the mixture evenly over the potatoes/ham (the pot will be hot, so if you choose to lift it out to pour the cheese mixture out, use pot holders and caution! I use silicone mitts). 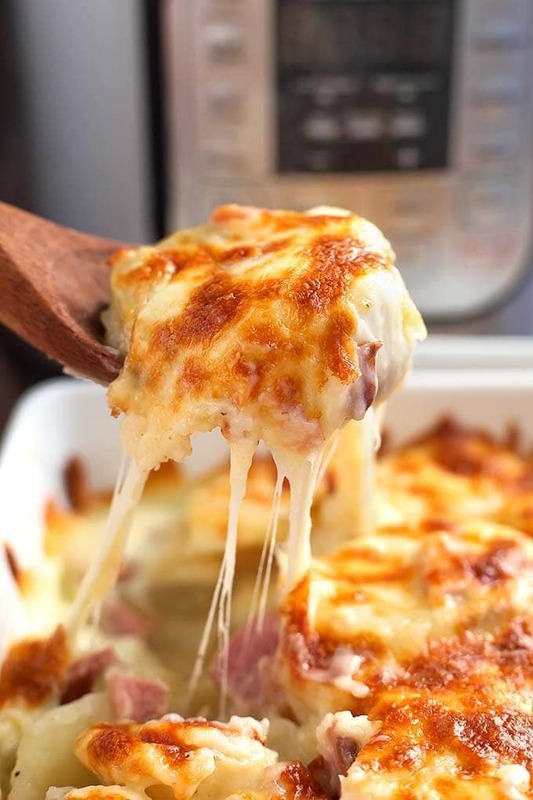 Sprinkle the remaining cup of cheese over the potatoes and set the baking dish under the broiler for 5-10 minutes, or until the cheese is browned to your liking. Keep an eye on it as it can burn rather quickly! *If you don't want cheese, you can make a béchamel sauce: Melt 4 Tbsp butter in the pot on Sauté - Low heat. Once melted, stir in 4 Tbsp flour until smooth. Increase heat to medium and slowly whisk in about 1 cup of milk until thickened by the roux. Add more milk to thin it, if needed. Then pour over the potatoes. Broil as directed to heat it through. We loved these scalloped potatoes! The best ever! Thank you for this amazing recipe!!! That’s great, JoAnne! Thank you for your review! What size Instant Pot are you using? I recently got a 3 quart mini for the 2 of us and most of the recipes call for bigger ones. I’ve read that recipes for the larger pots don’t turn out well in the mini. Any suggestions. Thank you for any help you can give me. I’m using a 6 quart pot for this recipe. Hey, that sounds pretty good for the first time! Thanks for your review! When you say one minute – you mean one minute!!! 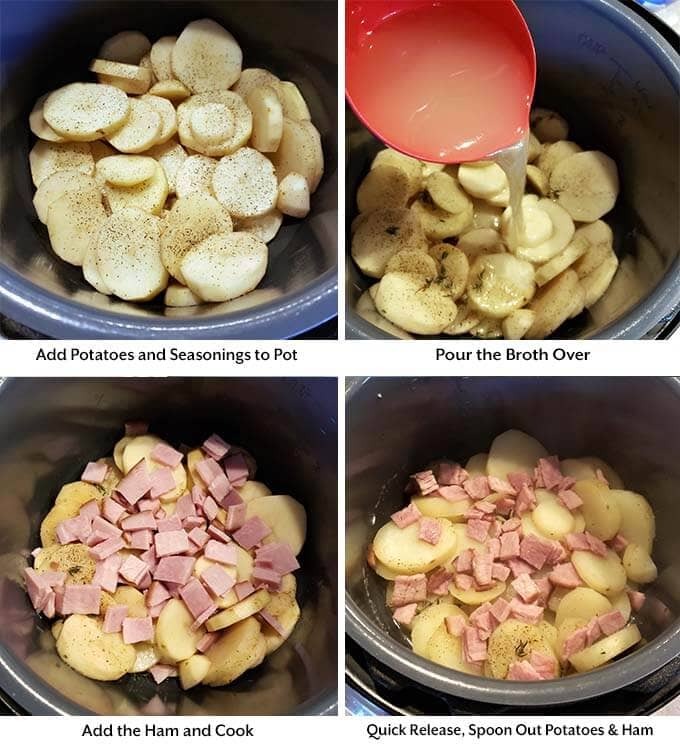 I did 2 minutes because I added additional potatoes and ham than what the recipe called for and 2 minutes was a tish too long, All was ok though and after sautéing the remaining liquid with cheese and heavy cream and bit of nutmeg … plus a few minutes under broil with remaining cheese and the result was SO GOOD! Our family of four ate it all! Lol Julie! Yes, the cut potatoes cook so fast! I tested several times and 1 minute was the best time. I’m so glad you and your family liked this recipe! Maybe my potatoes were cut too thin and clumped together, but I cooked in instant pot for 3 min, then put in oven to broil as directed. When eating, the potatoes were still kind of crunchy, so put in the oven at 350° for about 20 min. – they were perfect with amazing flavor. What should I do differently next time? The potatoes need to be cut 1/4 inch thick. When done pressure cooking, test for doneness by poking with a fork before continuing. That should help. Are you by chance at a high altitude? That will affect cook time. Really good. Added Himalayan salt. Pressure cooked for 10 minutes, would cook 8 minutes next time. Melted 2tbsp butter, added 1/2 co- heavy cream and melted cheese (med cheddar, mozz, parm, and a little pepper jack in pot. Heated oven tui 400 then Broiled for 10 minutes. Hi Tia, I’m glad you liked this recipe. I’m surprised that after cooking for 10 minutes your potatoes were intact! I only cook 1 minute. Did you cut them larger than 1/4″? Can I double the recipe in a 6 quart instant pot and do I have to increase the pressure time if I do. Thank you! You should be able to double it. Keep the cook time the same. Use a 9×13 baking dish for the browning. Since my IP will be busy making your ham recipe,how would you cook these in oven? 350 for an hour or so? Thanks! Yes, about that. Slice the potatoes a little thinner. You can also use a slow cooker. Even better! How long in slow cooker? I imagine I would need to broil cheese at end. Low for 6 to 7 hours or High for 3 to 4. Broil the tops if you wish! 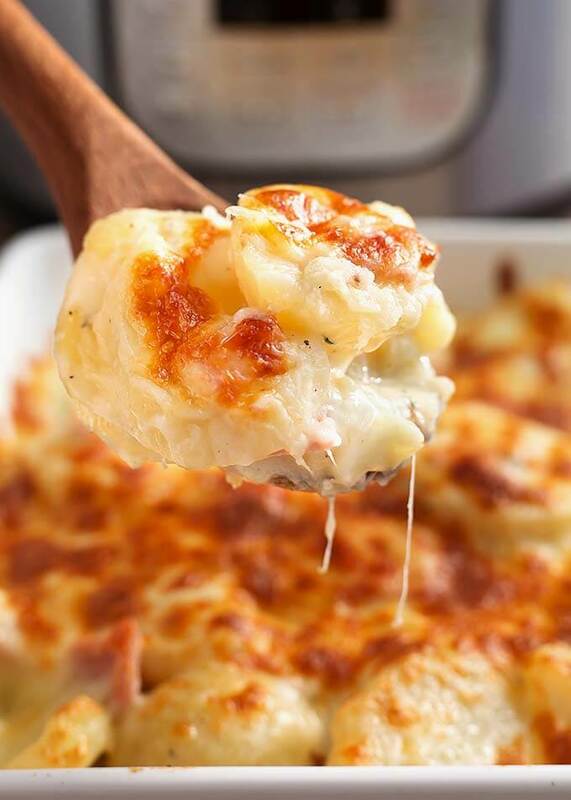 I do have a Slow Cooker Cheesy Scalloped Potatoes recipe that is very good. If I wanted to cook these in oven, how long and at what temp do you think? Thanks! 350° for 40 to 60 minutes.